Congratulations to all of the nominees for this year’s President’s Award for Student Volunteer of the Year! A new award created for 2014, the Student Volunteer of the Year recognizes volunteers who are students currently attending a BC college or university and have gone outside their comfort zone, shown tremendous spirit and teamwork. “I joined IABC/BC last year when I applied for a Student Communicator of the Year (SCOY) award,” says Denisa. She went on to win an Award of Excellence, and this year, took it upon herself to volunteer with the Student Services committee as Events Coordinator. Thrilled with the opportunity to grow her interests and skills. Major accomplishments include the overwhelmingly positive response from the Spring into Speed Mentoring Program that she helped organize and host. Denisa contributed to two sold-out events this year and acted as an IABC/BC spokesperson when interviewed with SFU Communique. Another valuable and rewarding year! Shaelah joined IABC/BC fresh out of high school last year because she wanted to gain hands-on experience and learn skills that couldn’t be learned in the classroom. Through meeting other industry professionals, she learned more about the communications industry and was determined to reach out to classmates so they could also gain a similar, enriching experience. 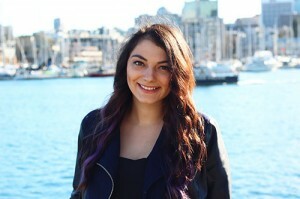 She started her volunteer journey by assisting the Bronze Quill Awards Gala team last year, and this year, she volunteered as an IABC/BC Student Community Ambassador at Kwantlen Polytechnic University (KPU). She took on a volunteer-lite role (one hour or less per week commitment) that allowed her to stay involved while managing her life as a student. Shaelah promoted IABC/BC through a class project that raised funds for the Eversafe Ranch Outreach Society. She also took every opportunity to mention the association to prospective partners, sponsors and KPU programs. Shealah works as an intern at Laura Bellance Media Group where she is captivated by advertising and promotions. She enjoys collaborating with clients and ideally hopes to work in tourism and hospitality, with a specialty in theme parks and attractions.